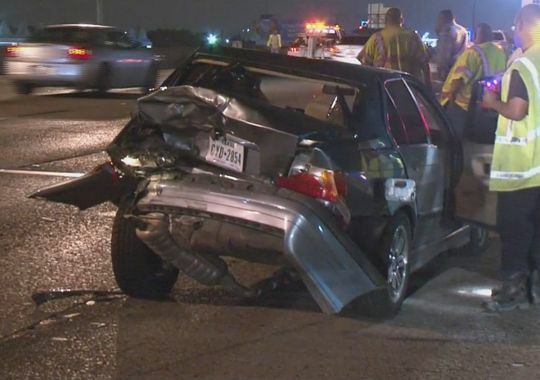 A major car accident on Houston North Freeway totaled several cars last night and sent a number of people to the hospital. According to KHOU’s reporter at around 11:30 p.m. a blue-colored Toyota Scion was stopped in the travel lanes, occupied by two men. 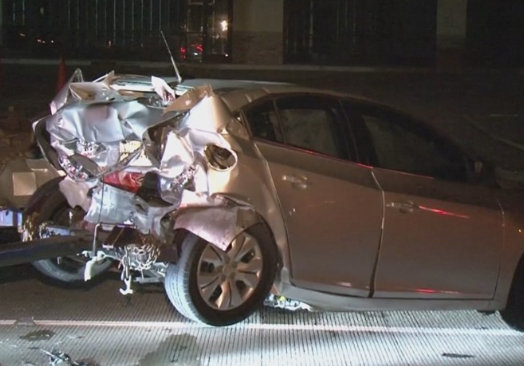 An SUV approaching from behind was unable to stop in time and rear-ended the Scion. The freeway was closed down as emergency crews worked the accident, which of course caused traffic to back up and that resulted in another accident at West Mount Houston, when an SUV driver didn’t see the stopped traffic until it was too late, hitting the divider wall and several vehicles. 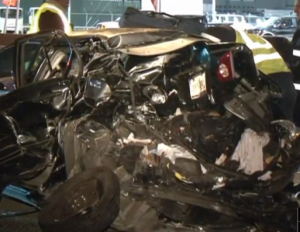 A woman was extracted from a seriously damaged Toyota (pictured below); fortunately her injuries were not life-threatening. A woman was cut from this Toyota by the fire dept. 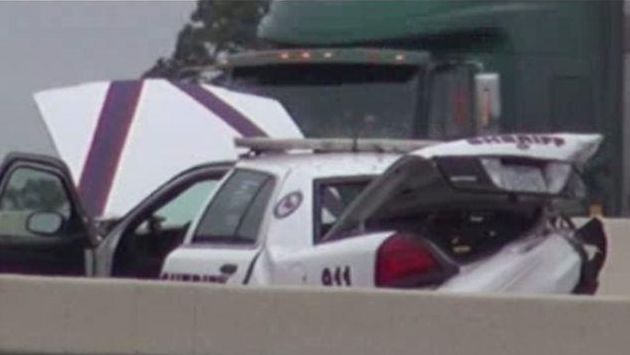 Deputy Robert Layman with Montgomery County Sheriff’s Office remains hospitalized after he and a colleague were struck by a vehicle on Interstate 45 North two days ago. Deputy Layman and Sergeant Jack Valenzuela were hit by a Jeep Cherokee SUV Wednesday morning as they walked back to their patrol car, having stopped to assist a motorist whose vehicle became disabled in a travel lane. Sgt. 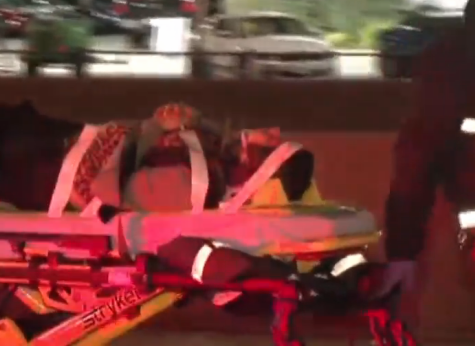 Valenzuela was released from hospital that day, however Deputy Layman suffered serious injuries and will probably be off the job for quite some time. The driver of the Jeep, a 50-year old male, is cooperating with the police investigation of the accident. The Montgomery County Law Enforcement Association has established a benefit fund to help Deputy Layman and his family with the costs of an extended time in hospital and out of work. Donations can be made at any Woodforest National Bank, and the check should be payable to the “Robert Layman Benefit Fund.” Hopefully Deputy Layman will recover in time to be home with his family for Christmas. 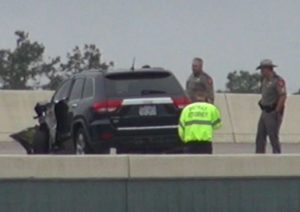 Hopefully the Jeep was covered by a large automobile insurance policy that will compensate Deputy Layman for his injuries and lost time from work. Claims involving serious injury and an extended hospital stay frequently involve dealing with negotiating large health insurance liens, and sometimes liens from short term or long term disability insurers. 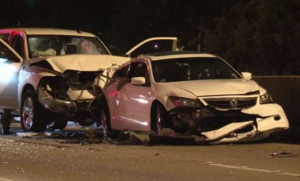 Just after 9:00 p.m. Wednesday September 3rd a man was killed when his gray pickup truck crashed into the rear of a highway construction barricade truck. 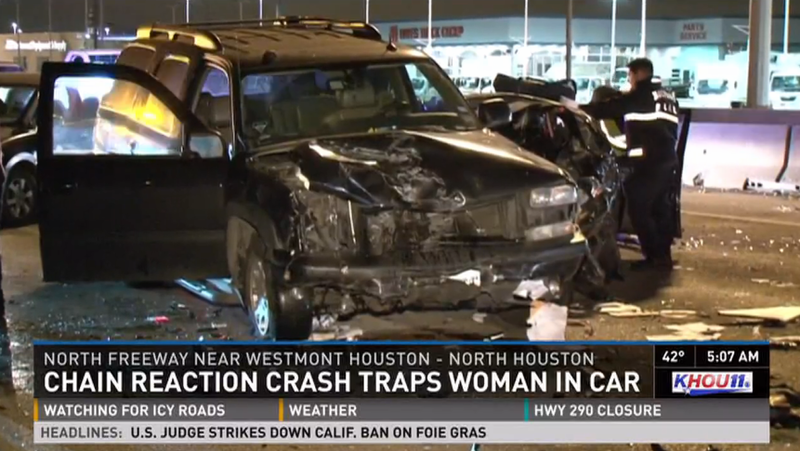 The westbound lanes of the Katy Freeway were closed for several hours. 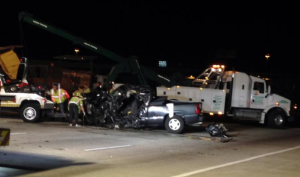 The cause of the accident remains under investigation. News coverage here. A man was arrested on suspicion of driving drunk after a three vehicle accident early this morning. 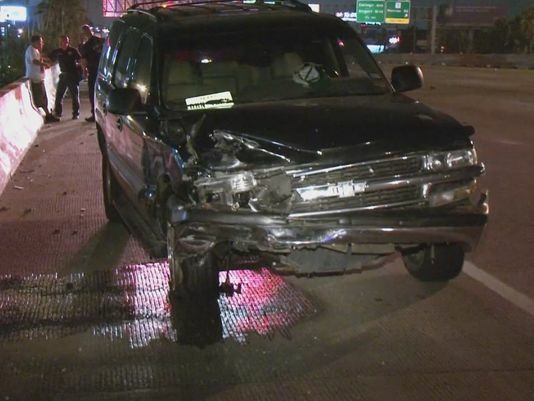 Around 1:30 a.m. a Chevrolet Tahoe traveling northbound on the Gulf Freeway struck the driver’s side rear of a silver BMW 3-series, causing the BMW to then hit a third vehicle. The back of the BMW shows extensive damage. The morning commute ground to a halt today due to a three vehicle accident. 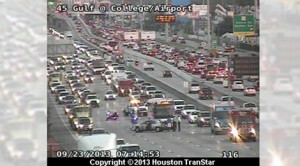 According to KHOU, an 18-wheeler rear ended a small car, causing the car to spin out and collide with a METRO bus. The accident happened around 7:08 a.m. on the Gulf Freeway southbound near the exit for Monroe Road. The driver of the car was transported to hospital with non-life threatening injuries.